The 50th Anniversary America’s Largest RV Show is set roll into the Giant Center℠ in Hershey, Pennsylvania, September 12 – 16. This year, exhibitors will show a record 1,400 new RVs, the latest in accessories, camping supplies and related products. The show is presented by the Pennsylvania RV and Camping Association. With 33 football fields of RVs from more than 40 manufacturers, there’s something for everyone attending the show. From the smallest fold-down camper to the luxurious Class A motor home, the Hershey Show has it all, including the largest selection of park trailers. Exhibitors will be on hand to discuss the features of the 2019 models, offer demonstrations and financing options. Inside the Giant Center, find the perfect accessories to make your RV trip more comfortable. There are also Free, hourly seminars on buying an RV, maintenance, the RV lifestyle and fantastic RV destinations. Families with young children can enjoy the new family tent this year. It offers a place to rest, coloring sheets and crafts to give children a little break from walking the show. 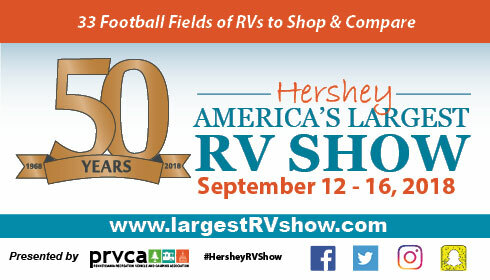 Make America’s RV Show a mini vacation while you’re at the Sweetest Place on Earth…Hershey, Pa. The Giant Center is next door to HersheyPark® and Hershey’s Chocolate World. Plan to stay at the Hershey Lodge® or at the HersheyPark Camping Resort and catch the Free shuttle bus to the show. Don’t forget to ask for special RV Show rates at the Hershey Lodge.